L-R: The fringe! - The fringe again! 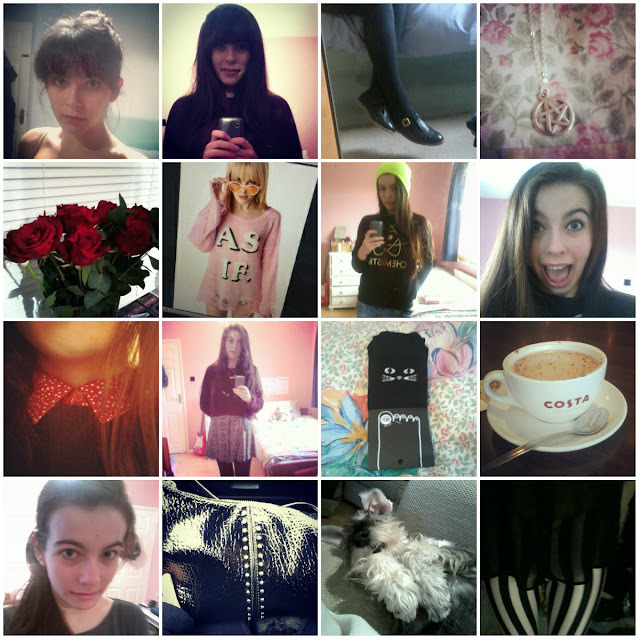 - New geeky t-bar shoes from Topshop - New Delilah Dust necklace - Roses from le boyfriend for Valentines - Need this Wildfox sweater in my life - Ootd - My excited-it's-half-term face - Heart print collared shirt - Ootd - Cat socks - Haattt chaaacaalaatte! - Looking fresh at 8AM - Stole my mother's Michael Kors bag - Le boyfriend's puppy looking all cute and weird - Night out with the girls in my beetlejuice black milk leggings. I love your new T-Bar shoes! They're not geeky! Really love the sockss, they're awesooome! Also the puppy is adorable, looks so fluffy and cuddly!